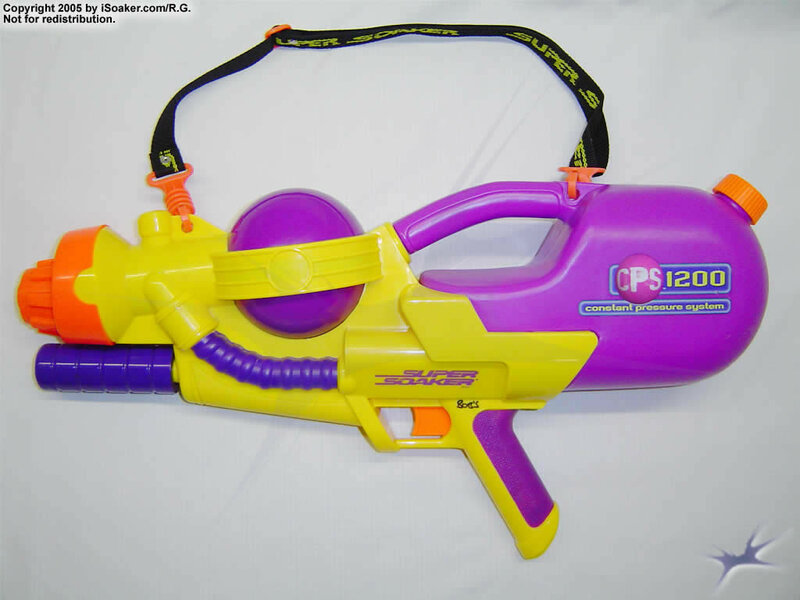 The Super Soaker CPS 1200 is a mid-sized, potent water blaster, equalling the Super Soaker CPS 1000 in usefulness. The shoulder strap and moulded handle make it easy to carry and refill the blaster. Its 5x-rated aperture unleashes a powerful stream from its mid-sized CPS pressure chamber. Along with its 2.35L water reservoir, good stream range, and quick repumping ability, the CPS 1200 is a formidable weapon on the water war front. Though the colouring and styling is different, it behaves similarly to the Super Soaker CPS 1000. The Super Soaker CPS 1200 makes a great all-purpose, perfect for small to medium skirmishes. It can also be used as a "heavier"-type backup weapon if one is using a larger CPS model as a main weapon. Mid-sized, light, easy to carry especially thanks to its shoulder strap. Despite its size, it packs good power and stream size. It also does not take too much effort to pump up the firing chamber. As with most of the CPS line, one can quickly empty the tank if being a little overzealous with the trigger. One thing to be careful of is the pumping mechanism which extends from the front of the blaster. This pump, though it appears to be fairly sturdy, should not be left extended for longer periods of time to reduce the chance of falling on it and breaking it, leaving the blaster useless. I recently purchased a Super Soaker CPS 1200 of eBay. I had never used a real CPS gun before and was stunned at the power. It even has a little kickback! The reservoir is decent sized and supplies a fine amount of water if you tap shot and fill it pump it then top it off. Mine seems to be a little above average. I think isoaker's is a little of a dud :) The 5x nozzle is stunning and will outsoak anything today. The pump is a little fragile so you have to be careful with it. Overall a fantastic gun! I will soon post a review and test fire on Youtube. This is the only CPS-line blaster that I have ever seen with my own eyes. I first saw it when someone brought it to the annual 4th of July soakfest. I tried picking it up, and pumped it a couple times, and pulled the trigger, and this huge blast came out and I was like,"WOAH! THAT'S POWERFUL!" I had only recently learned about the CPS line and didn't even know which CPS it was until I looked at the warning: "Do not leave CPS 1200 pressurized when not in use." The owner didn't take very good care of it though, and after a couple more water fights, the pressure chamber was cracked open and the blaster was hardly in one piece. It still worked though; that proves how hard it is to completely break. So after nearly a year of visiting Goodwill every other day, I suddenly found a NIB CPS 1200 on the shelf for $10! I bought it (obviously), and now I made a review. The nozzle is large, and shoots an impressive-sized stream that's rated 5x. It shoots nice and far, and it has good shot time for a CPS blaster. The nozzle is big enough to look into, and you can see the laminator inside. The pump is not tracked and feels kinda flimsy. Be careful with it; If you fall while running with it and the pump is extended, or you leave it extended and someone stomps on your CPS 1200, or you're just pumping way too hard, it could break. The pump grip is comfortable, but sometimes I get my hand pinched in between the pump and under the nozzle. The grip is comfortable. By the way, the CPS 1200 can be used with one hand without the strap, although not very comfortably. The trigger feels kind of like a "clicky trigger" when it's pressurized, probably because of the pull valve. The reservoir was put in a pretty comfortable place. It has good capacity, although it may be a little too big compared with the rest of the gun. The cap is tethered, and interestingly, it seems to be the exact same tether used on newer blasters like the Shot Blast or Hydro Cannon. The CPS 1200 includes a strap. It can pretty easily be used without the strap, but it's nice they included it. It seems a little old (go figure), and it feels like it might break, but it hasn't so far. This blaster looks okay. It's only more attractive to me because I know how powerful it is. There are two color schemes: yellow/purple/orange, and silver/purple/orange. The silver one probably looks cooler, but the yelllow one is more powerful. Blasters like the CPS 1200 are worth about $30, which is a good price considering how powerful it is. I believe it was originally $20, but since it's not availible anymore, that price doesn't matter. As I already said, I found mine for $10. The CPS 1200 Mk1 and Mk2 (yellow versions) are more powerful than the Mk3 and Mk4 (silver versions). Mine is the yellow one. If you have a choice between yellow and silver, get yellow (unless you need to be as unseeable as possible). This blaster can be used as a nice, light gun with awesome power. It is kind of "heavy" compared with most blasters these days, though. Anyway, in most water fights, this can be used for pretty much anything. It has good shot time, doesn't require very many pumps, and isn't huge. Great for running around shooting people, scaring opponents (in most cases), taking to places where you can't bring something ridiculous like a Monster XL, and if you're strong it can be used as a heavy backup. But usually it works great to use it alone. Overall, the CPS 1200 is awesome. It has a great stream size and will easily beat any blaster made today. Works great for any purpose, and it's price is good too. If you don't want to pay something ridiculous for a water gun, this is a good choice. Check out the CPS 1000 or 2100 too though. The CPS 1200 was released in 2000 replacing the 1000. It shares many of the same features almost everywhere; of course there are differences in some places, although the basic recipe is pretty much the same, which makes this soaker very good still, in fact, the 1200 is one of my favourite soakers, although I reckon my model is a bit of a fluke. The 1200 in terms of power is again like the 1000 with a 5x nozzle is good enough to piss off an opponent, if not a little bit more since in general the 1200 can fire slightly longer, not with mine though, so to me if you get lucky it can do more than piss off an opponent, it can piss them off quicker. The reservoir holds slightly more water at 2.45L. However it is not drastic enough to give an unfair advantage, it isn’t like someone with a gun against someone with nothing who wants to get shot. The design is different, the size is the same, the shape isn’t, nothing wrong with that, adds variety, it’d be a bit crap if everything was the same. It is still simple and easy to use, with the same quick pumping along with the strap to give a smaller sized yet effective soaker. In terms of general use it actually feels a bit smoother than the 1000, which means it’d go good with drinking a pint. The range is also very nice just like with the 1000. As usual though it is not perfect, and it does stumble in places. One being the colour scheme depending on what model you get is hit and miss. The yellow and purple on the earlier model is rather controversial, however if you really are picky on colour there is a silver and purple version released a year later in 2001, but again that is not to everyone’s taste. So you have a choice, camp, or cheesy. I don’t really care to be honest about the colours, mine’s cheesy, however with the ferocious blasts mine gives opponents will never wished they laughed at the colour. Another problem like the 1000 is the pump not being tracked again, although on the 1200 its worse, as the actual plastic pump tube is smaller in width, so be careful even more unless you reinforce it. While the reservoir is slightly larger, you can still run out pretty quickly if you hog the trigger too much as your best friend. Again, despite the problems, they aren’t enough to bring the 1200 down enough to the point where it is terrible. Just like the 1000 it is just as recommended and is a great soaker, it is mostly the same in all the crucial areas for a soaker this type. Either one you buy is a great decision. The CPS 1200 like the 1000 as well at the moment you can find at price that won’t tear your wallet in half either. If you see one it would be a good idea to buy it given they are discontinued now. Air pressure users are pretty easy targets along with most of the new crap that is out now. Similar soakers like the 1000 and 2100 are a good well rounded match along with the Monster series being reachable. Be wary of larger CPS’s like the 1500 although even so the 1200 has enough staying power to cope. Air pressure soaker users watch out, and most new crap soaker users just don’t bother for the most part unless you don’t care about losing (you must be mad!). Similar sized soakers like the 1000, 2100 will prove a good challenge. Anything bigger then you have the advantage, but not exactly by a mile by any means. Only use older powerful XP’s if you know what you are doing for the most part. Oddly enough, I have never done a CPS 1200 review. But since the CPS 1200 seems to have somewhat of a not so great reputation, I simply had to write one. Well, the filling is relativly easy just like any small CPS cannon. Fairly sturdy build and no major leaks. The pumping is very easy and smooth. Not as durable as a trackmounted pump, but then again trackmounted pumps are less smooth when pumping. Performance is where it shines. I remember when I sold CPS 1200s on ebay 2004, I mentioned that it is more powerfull than a CPS 2100, and other sellers(who sold CPS 2100s) where calling me a liar since that somewhat ruined their claim of their item being the most powerfull soaker on ebay. Well, I wasn't lieing, and it is a very likely fact. The first second of output of the CPS 1200 in this review got around 275 ml. Thats 9.1X. Obviously, not every second will have 9X output, since the PC would have to be around 800 ml large. So the output would whine down to the end around 7X-5.5X at the last second. To show that I am not bull-crapting you, I even made a litle domo clip of the 1 second output. Which shows that a CPS stream might not be so constant with output than usualy believed. Also, the archieved distance was a 40-45 feet. Which is impressive for a small CPS cannon and fairly better than the 35-40 that most of my CPS 2100s got in the past. I said it a few times before, and I will say it again. The CPS 1200 is probably my favorite small CPS cannon(and I have used them all) and very underated in forums. I like it more than the CPS 2100, just a tad more than the CPS 1000, and alot more than the Blazer. Unless someone is very desperate for a large vararity of nozzle selections and prefers those over raw power, the old CPS 1200 is a good choice over anything right now on retail. Edit: I also used the grey CPS 1200 version, and it felt weaker and distance seems less to. The internals are also somewhat different. So if you get a CPS 1200, you will have to decide if you want power or looks when it comes to the different versions. Total Capacity (including firing chamber): 100 oz. Weight when not Filled: 2.5 lbs. Weight when Full: 10 lbs. I just got the CPS 1200 (its predecessor is the CPS 1000), one of the greatest Super Soakers ever made. It packs great power for its size and is very mobile. The 5x nozzle can easily drench someone in a matter of a few shots, but if the user is too "trigger-happy", the water can quickly be drained. Even when the soaker is completely full, it only weighs about 10 pounds. Yet, the shoulder strap is still a nifty thing to have. One turn-off about the CPS 1200 (98' version) is the bright colors; that can easily be fixed with some good camouflage. This blaster is a good main weapon for snipers and grunts. Although, I wouldn't recommend taking on anything higher than a CPS 1700 mainly because this soaker can easily be over-powered with any weapon with a higher than 10x rating. Overall, this is a great blaster to have in your arsenal. With all of the above considered I give this gun a rating of 9/10. Pros: Lightweight, packs good power for its size, the shoulder strap makes it easy to carry, and very mobile. Cons: Like most CPS' one can quickly drain the water in the soaker if not careful to conserve water, bright colors, can't easily match up to larger CPS'.